The Season is Here! Time to install or fire up those window air conditioners. Most newer homes nowadays are built with air conditioning pre-installed, of one type or another. Older homes, however, were seldom built with air conditioning. I have often wondered if the oldtimers were just tougher than this new generation. Often it has been explained to me that air conditioning was simply a luxury that many people felt they could do without - especially because of the operating expenses. It is very true that the central air conditioners of old were very inefficient (and noisy). Seer ratings as low as 6-seer or 8-seer are still found being used today. But one by one they are being replaced by savvy homeowners that have tired of ridiculous power bills. 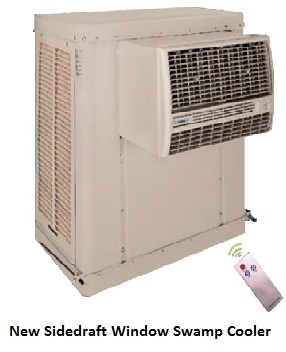 Air conditioners with seer ratings above 21 are now available from most manufacturers. Window air conditioners are following the same trend. They are getting much more efficient and quieter. The window air conditioner certainly has a place in homes today. Especially in the older homes where installation of a full central unit stretches the budget of the homeowner, or installation cannot be easily accomplished without major remodeling (this can also be good argument for a window unit in a newer home). Another issue to consider is the property line. Often these smaller, older homes were built close together. 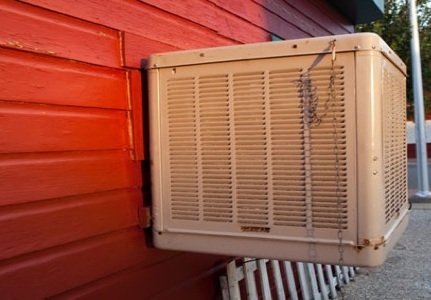 Now building codes are in place prohibiting how close an outdoor condensing unit may be placed to your neighbor's property. We are all familiar with window air conditioners from the sight of them protruding out the side of many a home. These units come in all sizes, efficiencies, brands, colors. Some shake the windows of the house next door upon start-up. Others run very quietly. It is sad, but true, the newer the unit the easier it is to tolerate. Window units can come as swamp, or evaporative coolers , as well. These units can range from very small to quite large, requiring suspension cables on the outside of the home to carry the weight. Some have a water tray in the front of the unit that needs filling as water levels drop. These usually have some method to check the water level. Most have at least 2 blower speeds. As with the common roof mount swamper, most can be fitted with an exterior water line that feeds a float level controlled water reservoir. Slightly opening a window on the other end of the house helps the cool air to circulate through the house. The other type of window air conditioner is similar to the whole house air conditioner in it's operation. Hot air is removed from the home and disbursed to the exterior. The cooled air which is circulated back into the home is air which the heat has been removed from. Manufacturers make recommendations as to the square feet a particular unit can cool. Use this recommendation loosely. This guesstimation does not take into account any attributes of your home, or the region where you live. Perfect-home-hvac-design can provide a room-by-room manual J calculation which will determine the cooling needs of each room in your home. The manual J calculation wants your whole house to be conditioned. Each non-conditioned room in the home will have some effect on the other adjacent conditioned rooms. Your intended rooms for cooling should be completely isolated from the other non-conditioned rooms. Your designer should be made aware of all factors. A human body puts off heat! This is another factor which affects the performance of your window air conditioner. Phhd does not endorse or support "rule of thumb" design methods. We present this only as a loose guideline. If you are not going to take advantage of a manual J calculation, the following should be considered only a starting point for your sizing decisions. Capacity is measured in btus, or British Thermal Units , per hour. To figure the size unit you need, find the square footage of the space you intend to cool. Square footage is width of the space X length of the space. Add 600 btu for each person regularly occupying the space, in excess of 2 occupants. Add 10% capacity if the space is heavily in the sun. Add 4,000 btu if the unit covers a kitchen. 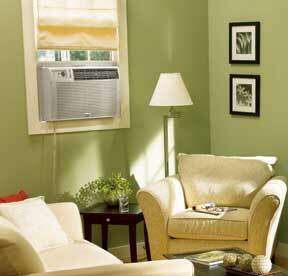 Electrical considerations The best window air conditioner will plug directly into a 110 volt receptacle. Most window AC units below 14,000 btus will run on 110 volt power. Units larger than this will usually require 240 volt power, which is usually not available near the windows where you will want your AC unit, if available at all. Common windows sizes will accept a good sized air conditioner. In some of the older homes, it was quite common to have 2' wide x 4' tall windows. Some manufacturers produce AC units specifically sized for these thinner windows. The most important point is that the AC unit must fit in the opening with some space to spare. Window AC units have an accordian style spacer, which slides out to meet the window frame for a good seal. The window itself slides down to seal against the top of the unit.